There are striking similarities between the Indian and Sumerian civilizations. One of them is the use of the Double Headed Eagle as a royal symbol. From 3800 BC until today this mythical bird is used as a symbol of royalty. Russia and other Eastern European countries use it on their currency notes and national flags. Tamil Nadu, Karnataka and Andhra Pradesh praise the mighty strength of this bird in coins, sculptures and literature. The Panchatantra used the story of double headed bird, also known as Ganda Berunda bird, to emphasize unity. Ancient Cankam (Sangam) Tamil literature used this bird in their love poetry. Devotional poets of India like Ekanath also used this bird as a simile. Sumerians considered this bird the symbol of God Ninurta of Lagash. They thought it had divine power. We can trace the history of this mythical bird from the Sumerian days. A cylindrical seal shows the double headed eagle from 3800 BC. Later, the Hittite empire which had its capital in Bogazkoy (in Modern Turkey) used it in several monuments. Even today we can see the monuments displaying this symbol in huge sculptures in Hattusa and Yazilikaya. Bogazkoy was the place where a tablet with the names of the Vedic Gods: Indra, Mitra, Nasatya and Varuna was discovered. The tablet was dated 1380 BC. This establishes the Indian connection of the region. Even the Holy Roman Empire and the Byzantine Empire used this symbol. This Hindu symbol was used by the Christians. In Sanskrit literature – the Panchatantra (book of fables) has a story about Ganda Berunda bird. It says that the bird had two heads but one stomach. In the story, one head wanted to drink Amrita (ambrosia) but the other head went for poison. Ultimately, the head that drank the poison made the bird die. The moral of the story is that disunity is dangerous. Tamil literature, dated two thousand years old, mentions it in three places. In Akananuru, poet Kapilar (verse 12) compares this double-headed, single-bellied bird to two people in love. Though there were two physical bodies, they have one life. Nallanthuvanar also used this simile in Paripatal (Verse 8-72). But another Tamil poet Maruthan Ilanagan in Kalithokai (verse 89) used this bird in the form of two fighting heads, like the Panchatantra story. It shows that Indians from one end of the land to the other knew this bird very well. Thakadur Yaththirai is a lost Tamil book, but excerpts are available as quotes in other works. These quotes compared the fight between two kings Athiyaman and Peruncheral Irumporai to the double headed bird fighting with itself. (Ref. Purath thirattu verse 785). The most imaginative story of the bird comes from the Vijayanagar Empire. Gold Coins issued by Achyuta Raya (1530-1542) show the Ganda Berunda bird lifting an elephant in each of its beaks. Its power is legendary. Other coins show each head holding a snake. Before Achyuta Raya Devaraya II (1422-1446) issued coins with the bird’s name in Deva Nagari script. Jain Stupa at Sirkap, Taxila is the most ancient Ganda Berunda monument in India. 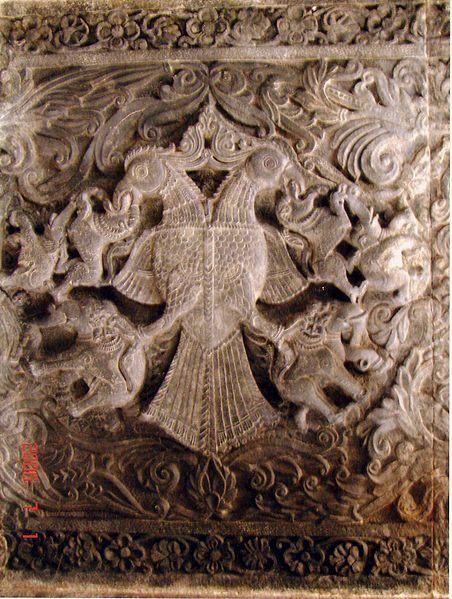 We can see this mythical bird sculptures in Srisailam, Keladi, Koramangala, Belur and the medieval art of Sri Lanka. Recently even dances were choreographed showing the magical strength of the bird. Dasara Flower Show in Mysore had a 10 foot flower decoration of the bird to commemorate the 500th anniversary of the bird symbol in Karnataka. The Wodeyar family of Mysore use this as their royal emblem. Later the Government of Karnataka used it as the emblem of the state. There are stories connecting this bird with the Narasimha (Man-Lion) avatara of Vishnu. 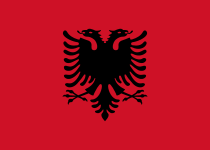 Eastern European country Albania has this bird in its national flag. Several countries issued stamps and coins as well. Russian Roubles and Kopeks had this bird. In the Eastern Province Erzurum of Turkey, a huge double headed eagle is being erected in 2011 which is visible from space. Turkey gives so much importance to this legendary bird. 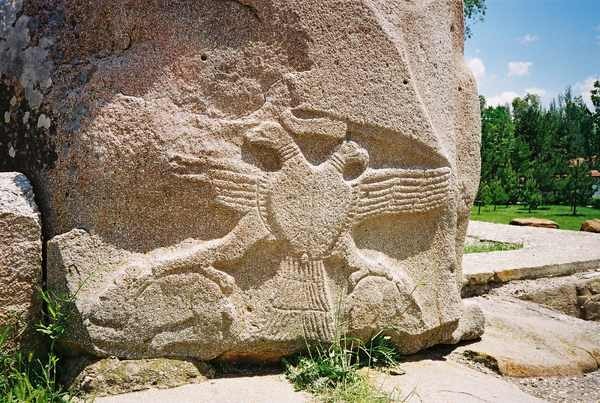 An ancient monument of Turkey shows this bird lifting two hares on its beaks. But the imagination of Indians made it a dinosaur lifting two elephants on its beaks! Please visit my blogs: swamiindology.blogspot.com and tamilandvedas.wordpress.com. Follow me on Twitter @Swami_48 and find me on Facebook. When Animals worship God, Why not Men? The Tortoise Mystery: Can we live for 300 years?